Jerry Garcia performing during the band's 1993 concert tour stop at Rich Stadium in Buffalo, N.Y. Grateful Dead founder Jerry Garcia, the enduring musical guru for legions of loyal fans over four decades, died early Wednesday morning, just a week after his 53rd birthday. Garcia died of an apparent heart attack while under treatment at a drug rehabilitation facility in Novato, Calif., where he was reportedly attempting to end a recurring heroin habit. His body was found in his room by a counselor at the Serenity Knolls drug rehabilitation center. Attempts to revive him failed. "We loved the man, and he's gone," McNally said. "The one thing I'm clinging on to is that when he went into the facility he didn't tell any of us. He just wanted to regain his health. He went out wanting to get healthy and making a commitment to his art. That's the way I'm going to remember him." Contemporary musicicans joined fans, known world-wide as "Deadheads," in mourning the serene singer and guitarist. "There's no way to measure his greatness or magnitude as a person or as a player," said singer-songwriter Bob Dylan who toured with the Grateful Dead in 1988. "He really had no equal. His playing was moody, awesome, sophisticated, hypnotic and subtle. There's no way to convey the loss." Garcia's death leaves uncertain the future for the most direct musical and cultural link to San Francisco's '60s hippie heyday. Through the intervening years and sweeping social upheavals, the Dead and its following not only survived, but flourished. That phenomenon was evident in the thousands of tie-dye-clad fans -- kids and adults -- who followed the band around the country, reveling in both a communal spirit and the band's lithe, long improvisational mix of rock, blues, country and folk. To those who were not fans, the attraction of a Grateful Dead show was a mystery, but to those who were it was a near-religious event. Many fans and associates Wednesday said they could not imagine the Dead continuing without Garcia, but McNally said no decision about the band's future would be made immediately. The group has survived other deaths -- Ron "Pigpen" McKernan of liver disease in 1972; his replacement, Keith Godchaux, in a car crash shortly after leaving the band in 1980, and his successor, Brent Mydland, of a drug overdose in 1989. Garcia had a long history of health problems stemming from a combination of drug use, cigarette smoking, diabetes, an inability to keep his weight in check and the stress of the grueling tour schedule of the Grateful Dead. For years, Dead tours have ranked among the top concert attractions in the U.S. In 1994 the group grossed $52.4 million in concerts, ranking that trek as the eighth biggest such tour in the United States. Through the first half of 1995, grosses reached $29.3 million. Garcia nearly died in 1986 after lapsing into a diabetes-related coma. He made attempts after that to improve his health, taking up scuba diving and improving his diet, but his efforts were inconsistent. A 1991 tour was postponed after Garcia collapsed from exhaustion. Garcia's stay in the rehab center was in preparation for the band's planned fall tour. His final show with the Dead was July 9 at Chicago's Soldier Field stadium, concluding a spring tour that had been marred by several incidents involving fans, including a rock-throwing confrontation with police in Noblesville, Ind., earlier in July and the death of several Deadheads camping out before a concert when a porch they were dancing on collapsed. Born Aug. 1, 1942, in San Francisco as Jerome John Garcia, the son of a band leader, he was active in the San Francisco Bay Area folk and bluegrass scene of the early-'60s and founded a rock band called the Warlocks in 1965. The following year the group -- at the time also including guitarist Bob Weir, bassist Phil Lesh, keyboard player McKernan and drummer Bill Kreutzmann -- became the Grateful Dead and was established as the house band for the psychedelic drug-fueled "Acid Test" parties, as chronicled in Tom Wolfe's book, "The Electric Kool-Aid Acid Test." But fans generally agree that no recordings ever captured the feeling of a concert, even the numerous concert recordings. Its live shows made the Dead a legend -- as summed up in the oft-used fan-coined slogan, "There's nothing like a Grateful Dead concert." At the center was always Garcia's fluid guitar playing, weaving a tapestry as colorful as the fans' garb. The music at the shows, often held in festival-type settings, often devolved into unstructured jams which served as a sinewy soundtrack for a vivid tableau of free-form dancing fans. Though albums became more sporadic after the '70s, one, "In the Dark" in 1987, spawned the band's only Top 10 hit. The song "Touch of Grey," featured the Garcia-sung chorus proclaiming "I will survive." 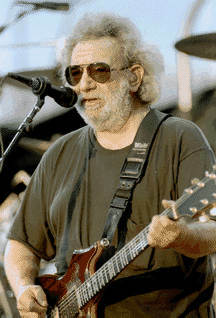 Garcia often toured with his side-project, the Jerry Garcia Band, helping Deadheads fill the time between Dead treks. Garcia also was active in the group's Rex Foundation, a philanthropic organization that gave grants to a variety of cultural, social and environmental efforts. Garcia is survived by his third wife, filmmaker Deborah Koons, whom he married last year; and four daughters, Heather, 32, Annabelle, 25, Teresa, 21, and Keelin, 7. Plans were incomplete for any private funeral services or public memorial observance.